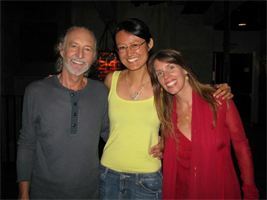 Miten and Deva Premal are rockstars in the sacred chanting scene. Their fans include The Dalai Lama, Eckhart Tolle, Anthony Robbins, Cher, and millions of happy listeners around the world, including yours truly (see photo on the right). Despite their remarkable success, Deva and Miten are generous, humble people who always make time to meet their fans and post inspirational messages on facebook. When I attended their Brisbane concert in February 2012, life was dark. I’d gone through a breakup on 11.11.11 (which, eventually, spurred my study of 11:11 clocks and belief in miracles). Unable to process my grief, I was also starving. Fortunately, the music that night was just sublime and helped me to start feeling again. After remarking to Miten that I’d just had a birthday, he gave me the biggest hug and a signed CD. I was so happy! I also had a look at his and Deva’s palms, which was a huge privilege. Since then, I’ve followed their music with great pleasure…I’ve just returned from their 2015 Ecstatic Chant Retreat in Mullumbimby. Singing with 200+ open-hearted people was absolute paradise. Let’s look at Miten’s amazing numerology – it’s full of ones, signifying courage and independence. Miten’s date of birth is 17/8/1947, giving him a 37/10/1 Pioneer Lifepath (find your lifepath here). Miten’s life purpose is intellectual and spiritual leadership – the 3 reflects a strong Solar Plexus Chakra and communication ability (the 3 looks like lips from the side). When in balance, he’s courageous, positive and has excellent willpower. Under stress, he may be self-critical or restless. The 7 makes him a seeker and teacher (7 looks like a cliff edge or open book). It gives Miten the ability and urge to dig deeper and find the truth in any situation. He learns by trial and error, not theory. Miten has double 7’s in his numerology (like Manose – see his reading), suggesting he’s sceptical and can’t be rushed into decisions. He needs to touch the wet paint, so to speak. 7 relates to the Crown Chakra and gives someone a regal air and ‘knowing’. They are selective, witty and full of ideas that come straight from Source. Words like SPIRIT, INTELLECT, GROWTH, SINCERE, SUNSHINE and EMOTION have a 37/10/1 vibration in numerology, revealing the gentle, sensitive nature of this lifepath. Careers such as COMEDIAN and SCIENTIST also have a 37/10/1 energy. Miten definitely has a droll sense of humour and he’s very articulate. A 37/10/1 lifepath is the sign of an independent, often single-minded person who becomes ‘someone’ in their chosen field. Famous 37/10’s include Napoleon, Aldous Huxley, Leo Tolstoy, Julia Gillard (Australia’s first female Prime Minister), John Howard (another Australian PM), Katie Holmes (she had a 4.0 GPA) and Lady Gaga. Read more on lifepath 1’s. Each of these stars is or was ‘one of a kind’ and you could say the same of Miten. Miten has a 1-4-7 Line of Practicality in his DOB, giving him a ‘tradie-like’ approach to work – he’s hands on, down-to-earth and productive. He also has the 7-8-9 Line of Action and Intuition, suggesting he works best as a ‘big picture’ problem solver and is closely connected to his angels and guides. Born in the UK, Miten began his career as a folk singer. By the 1970’s he was playing with groups like The Kinks and Fleetwood Mac. After becoming disillusioned with the rock’n roll lifestyle, he was initiated into sannyas by the Indian mystic Osho in 1980. Osho gave him the name ‘Prabhu Miten’ which means ‘Friend of God’. This name adds to a 46/10/1, or a 1 Destiny. This fits his 1 lifepath perfectly, meaning that what you see is what you get. Someone with 1 Destiny often works for themselves as they are a natural CEO or maverick. The vowels add to 19/10/1, or a 1 Soul Urge. This suggests that his intimate relationships teach him about the right use of power. 19 is a karmic number associated with a rapid rise and fall under public scrutiny, especially from age 19 (hm, sounds like the music industry to me!) Miten has said that he knows what it’s like to feel isolated, which makes sense given the multiple ones in his numerology (read this in-depth interview). I note that Osho was a 19/10/1 lifepath, so it’s no wonder Miten that found bliss in his presence. The consonants add to 27/9, or a 9 Inner Dream. This is the vibration of the word LEADER and gives Miten a serious air and sense of (sometimes heavy) responsibility. People would see him as a thinker. This name adds to a 55/10/1, also a 1 Destiny. So the change didn’t externally change Miten’s career, but it did intensify his creativity. Why? Because 55 is a double number, representing the Throat Chakra, the seat of the thyroid, intuition and vocal expression. Words like INTEGRITY, DISCIPLINE and the name MOTHER MARY reduce to 55 in numerology, suggesting the extremely high expectations and compassion required to live up to this name. The vowels add to an 18/9, or 9 Soul Urge, the vibration of words like LOVE and DANCE (read more about 18/9). This name change removes his ‘karmic debt’. The consonants add to a 37/10/1, or 1 Inner Dream. This is a lighter name for Miten to carry, as it means that he simply needs to be himself (i.e. a 37/10/1 lifepath) to succeed. Perhaps Osho knew numerology…he was obviously very intuitive. 1980 to 1981 (age 33) – this shows as a success in the area of ‘listening to his soul’. Miten was initiated into sannyas at this time. 1983 to 1986 (age 36 to 37) this was Miten’s lifepath activation period. By this point, he had left his previous musical path to devote himself to his Guru. 2001 to 2003 (age 54 to 55) – Miten’s career peaks from 55 onwards and 55 is also a time of accelerated spiritual growth in his chart. In 2002, Deva and Miten performed for the Dalai Lama. The number 6 represents the sixth sense. This means that Deva and Miten’s music opens your Third Eye Chakra, expands your mind and activates your higher vision. When our Third Eye is healthy, we see the good in ourselves, others and life in general. Our brains expand, so that we think for ourselves instead of following convention. We become artists, dreamers and humanitarians who care about the big picture. 6 is also the number of Venus, love and family (it looks like a pregnant woman). Read more about the Third Eye and Water. 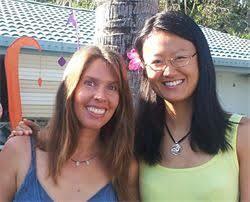 Many people who go to Deva and Miten’s events feel like they’ve come home to their spiritual family. In terms of challenges, 37-23 = A 14/5 Vibration. This is a karmic number of sensuality, suggesting that Deva and Miten have had to master temperance and honesty in order to stay together. Interestingly, they co-run Tantra-Mantra retreats for couples, where they teach about relationships. Miten has been in a testing cycle since May 2013, which has required him to strengthen his heart and raise his consciousness to keep up with rapid changes. In late 2015, he enters a master 33/6 personal year, which brings opportunities for creativity, fertility and education (TEACHER has a 33/6 vibration). Themes of love, family and work/ life balance are likely to arise. His efforts now will pay off by 2019-2020, which shows as a liberating time in every area of life. I wish him, Deva and Manose all the best! See Deva and Miten’s official website for music and events.